Denis Villenueve’s Prisoners is something of a paradox. Intelligently crafted, with a host of psychologically complex characters and a heavy dose of religious symbolism, the movie sets up a compelling scenario but allows too much ambiguity, both in the motive of a key character and an intensely irritating final shot, to creep in — as well as sometimes straining our suspension of disbelief. We’re given an insight into the psychological make-up of carpenter Keller Dover (Hugh Jackman — The Prestige, X Men: First Class) in the very first shot, in which we here the Lord’s Prayer recited while a deer steps into view from behind a thicket of trees in a Pennsylvanian forest. Dover is teaching his son to hunt, and on the journey home, lectures him about the need to ‘pray for the best, be prepared for the worst’. While it’s perhaps going a little too far to describe Dover as a God—fearing man, he is at least respectful of religion even if he fails to adhere, or really understand, its commands — a flaw which will prove to be his downfall as events unfold. The contentment of Dover’s domestic life is shattered one Thanksgiving when his daughter (Erin Geramisovich) and a friend (Kyla-Drew Simmons) go missing. Dover’s teenage son, Ralph (Dylan Minnette) recalls someone watching them from an old RV on which the girls were playing, which provides a key lead for the police once they become involved. The driver of the RV is Alex Jones (Paul Dano), a young man with the mental age of a ten-year-old who, to Dover’s mounting frustration, proves entirely unresponsive to the questions of the police. 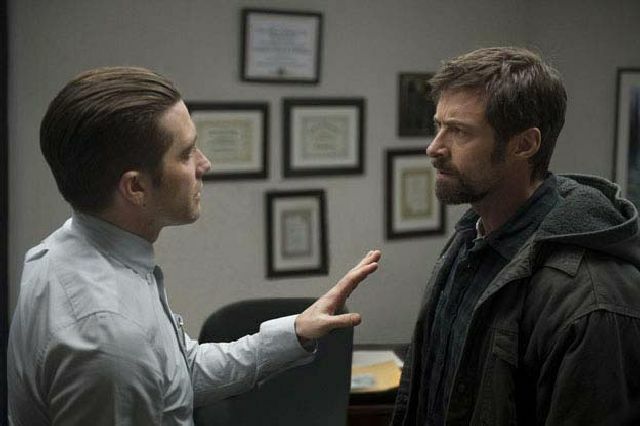 When Dover confronts Jones in the car park of the police station upon his release the boy tells him — out of earshot of anyone else — ‘they only cried when I left them.’ Dover’s frustration, and his growing impatience with the slowness of the painstaking investigation conducted by Detective Loki (Jake Gyllenhaal), eventually leads him to abduct Jones and imprison him in an abandoned building where he systematically tortures the boy in an attempt to discover the whereabouts of his daughter and her friend. The abduction of their child is of course every parent’s biggest fear, so Prisoners has a built-in emotional trigger with which to immediately hook its audience. But what director Villeneuve (Incendies) and his writer Aaron Guzikowski (Contraband) are more interested in are the moral questions raised by Dover’s decision to take the law into his own hands. Here is a good, simple man, one with a very straightforward concept of right and wrong, a reasonable man driven to commit monstrous deeds in an attempt to overcome an evil that soon becomes apparent is only perceived. Is he justified in doing what he does? Do the means justify the end? On the surface, most people would say yes, but Guzikowski adroitly muddies the water by making the suspect an intellectually-challenged man-child who is barely able to string half-a-dozen words together, but is capable of spitefully harming his aunt’s defenceless dog. And suppose Dover is mistaken, as he slowly begins to fear that he is. Prisoners’ plot takes some unexpected turns, slowly drawing together various strands of the investigation in complex ways. Some of these are handled less than convincingly: Loki’s perception is a little too keen, his deductions of Holmes-like proportions, and the manner in which clues vital to the plot are uncovered are just a little too convenient. Similarly, the final ten minutes of the movie — while not a disappointment as such — firstly ask us to believe that the police wouldn’t conduct an immediate, exhaustive search of a crime scene before, with its open ending, posing a parting moral question which, given Loki’s behaviour up to this point, simply isn’t in any doubt. Prisoners is two-and-a-half-hours long, and although it doesn’t feel overlong, it could probably have been tightened up with the excision of ten minutes or so. The performances are good, although despite Jackman having the flashier part, it’s Gyllenhaal who takes the honours. You kind of sense that Jackman’s at the top of his game here, while with Gyllenhaal I suspect there’s a lot more to come.